For more than 12 years, we have received thousands of letters from Real Living readers that want to win their own free makeover. 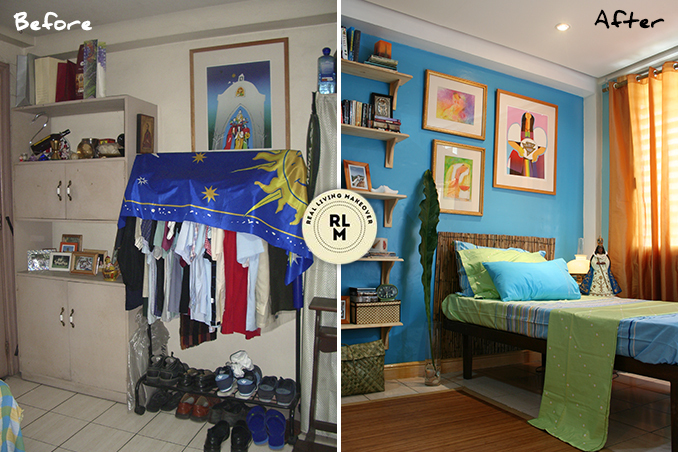 Since most of the letters are from small homeowners, young professionals, married couples, or returning OFWs, we were surprised to receive this makeover request from a Catholic priest! In his letter, Fr. Paul Marquez of the Society of St. Paul says that after his priestly functions, he retires to his room exhausted. However, instead of feeling calm and relaxed in his private place, he often feels stressed. He wanted to replace the dated and drab-looking furniture. He also would like to get rid of the sheets of paper on his work desk and the old clothes in his disorganized cabinet. To make the most of the tiny place, interior designer Andrew Galano drew inspiration from tropical design. He chose a refreshing color scheme and brought in brand new pieces. He also turned the area into a clean and organized haven. Read the original article in the April 2007 issue of Real Living Magazine. Download your digital copy of Real Living on the Real Living App. Log on to summitnewsstand.com.ph/real-living for more details.